On January 1, 2004, Fidel Castro marked his fortyfifth year as the president and dominant ruler of Cuba, one of the world’s few remaining communist states. Aged 78 as of August of 2004, he is the longest serving head of government in the world, and only the Queen of England can claim a longer term as “head of state.” Although Castro continues to remain an active and visible leadership presence and faces no serious challenges as Cuba’s chief decision-maker, his exceptionally long tenure in office has provoked considerable interest in whether his eventual passing will result in the emergence of a communist successor government or instead produce a process leading to greater political opening and democratic reform. While it is too early to predict what form Cuba’s post-Castro politics will take in the long term, an internal succession process remains a viable outcome in the short term. There are several reasons for this, including an authoritarian organizational structure, the perseverance of a powerful state apparatus, a population that has grown accustomed to political disenfranchisement, and the limitations of international efforts to usefully facilitate political change in Cuba. Although the emergence of a stable democracy in Cuba is almost universally viewed as the preferred post-Castro outcome, it is far from a foregone conclusion. Indeed, some analysts have argued that Cuba is better positioned to achieve a communist succession than Eastern Europe or the former Soviet Union, and is likely to incorporate the lessons of the Chinese experience.2 Even if Cuba does move rapidly towards democracy, many members of the current government may be able to successfully reinvent themselves to compete in an electoral process, as occurred in many formerly communist countries in the Soviet bloc. Against that backdrop, this paper seeks to assess the prospects for Cuba’s future leadership by examining the key players that occupy top posts in the country’s current organizational structure. It is no secret that Fidel Castro’s aging has important political implications for the island’s future. Indeed, the state of his health is a subject of constant rumor and conjecture. In a well-known incident on June 23, 2001, Fidel Castro fainted from heat exhaustion in the middle of speech. In December of that year, he disappeared from public view for nearly two weeks, reportedly to recover from an infected bug bite on his leg. More recently, the left-wing mayor of Bogotá, Colombia, sparked a media firestorm when he reported that the Cuban leader appeared ill during their meeting, and there have been other accounts of fading lucidity. However, these types of observations are relatively few and far between when one considers the active, public schedule maintained by the aging comandante. He continues to travel widely and is a visible presence in daily Cuban life. He often manages to exhaust aides even half his age. While his infamous multi-hour speeches have become less common than they were a decade ago, they still occur with surprising frequency. Thus, Cuba’s political system is caught in the crux of an unenviable dilemma. Despite the authoritarian institutional structure supported by many levels of popular organization, Cuban communism is inherently dependent of the bulwark of Fidel Castro’s charisma and his embodiment of the national identity. The island’s top policymakers have led their entire professional lives in a system where politics consist of lobbying a single decision-maker and implementing his decisions. Although Cuba entered a period of limited economic experimentation following the economic crisis triggered by the collapse of the Soviet Union in the 1990s, the last several years have witnessed a return to increasingly orthodox policies. As a result, the risks of internal dissent remain high at a time when gathering economic troubles have increased the costs of adherence to Marxist policies. This has resulted in a great degree of caution and conservatism within Cuba’s inner political circles, especially among people who are positioned to occupy key roles in a post-Castro government. There is little incentive to push aggressively for greater reform today and risk losing a key position, only to find oneself on the outside looking in when the post-Castro moment finally arrives. Similar fates befell former head of ideology Carlos Aldana in 1992 and former foreign minister Roberto Robaina in 2002, both reform- minded rising stars in the Cuban hierarchy, who were expelled from the Communist Party when they fell from Castro’s favor.5 Although the risks of deviating from the party orthodoxy will remain high for the foreseeable future, it is important to remember that Castro will leave behind him an authoritarian political structure that will be inherited by the country’s top decision-makers. This institutional framework will undergird any future succession process. Cuba’s highly centralized governmental structure does not merely result from the charismatic power of Fidel Castro, nor from the fact that he controls certain portions of Cuba’s political system in ways that allow him to influence other structures not under his direct authority. Power in Cuba does not flow from the bully pulpit or from popular support. Rather, Fidel Castro and his close supporters are at the center of multiple, overlapping power structures, including the Politburo of the Communist Party, the Council of State, and the Council of Ministers.6 Cuba’s military, the Fuerzas Armadas Revolucionarias (FAR), is a powerful institution in its own right and is closely blended with the political structure of the country. As President of Cuba, Fidel Castro serves as the commander- in-chief of the armed forces. His brother, Raúl Castro, is minister of defense. Many other top military officers serve in key roles in the Politburo, Council of State, and Council of Ministers, and the army exercises disproportionate influence in Cuba’s largest state-owned enterprises. Most key figures are also represented in Cuba’s 609 member National Assembly, which, in practice, lacks the capacity to arrive at decisions contrary to the top decision-making bodies. If the institutional framework around Fidel Castro persists after his passing, then Cuba’s next leader will be able to exercise significant institutional authority by fulfilling these multiple roles at once. If Cuba instead begins to practice a division of labor among the highest posts—for example, if the posts of first secretary of the Politburo and the president of Council of State are held by two different individuals—then this would presage the establishment of competing power centers within Cuba’s government. Managing those tensions would be an unprecedented challenge for communist Cuba. As illustrated in Figure 1, there is significant overlap between the Politburo (24 members), the Council of State (31 members), and the Council of Ministers (38 members), with 19 people serving in at least dual capacity and 7 people serving on all three organs of state. Put another way, only 67 members of Cuba’s current government serve in all three of these state organs combined. Cuba’s political organization is modeled on the former Soviet Union, and finds its basis in the 1976 constitution that was heavily modified in 1992. Due to the overlapping leadership in all of the main organs of the party and state, the Cuban government is essentially devoid of checks and balances, although procedures do exist that mimic normal oversight functions. The National Assembly must ratify all high-level appointments, and members of the Council of Ministers can be hired and fired by the Council of State, which also provides legislative approval for measures when the National Assembly is not in session, which is most of the time. 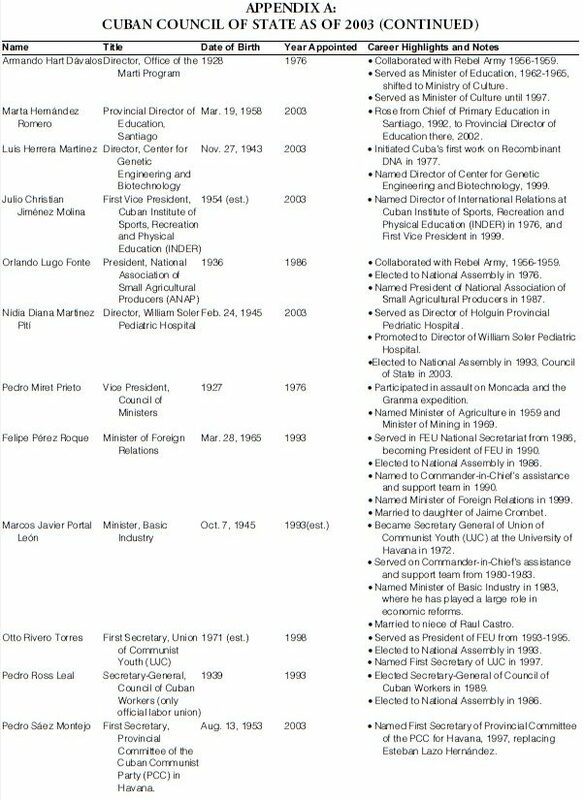 (A full list of the members of Cuba’s Council of State can be found in Appendix A.) The Council of Ministers is the largest of the ruling bodies, consisting of a cabinet-like group of administrators plus the executive leadership of the country. This body has wide-ranging powers to run the country, manage the budget, and set foreign policy. Members of the executive committee of the Council of Ministers are also part of the Politburo of the Communist Party. Under the Cuban system, the president of the Council of State is “head of state,” the president of the Council of Ministers is “head of government,” and the executive secretary of the Politburo heads the Cuban Communist Party. All three posts are currently occupied by Fidel Castro, although there is no constitutional provision mandating that all three bodies must by led by a single person. One possible succession scenario could result in a division of labor between these multiple roles, thereby moving away from the seamless authoritarian control established by Castro. Yet Raúl Castro’s potential ascension to the top spot is not merely a product of fraternal loyalty. He occupies the number two position in the three principal bodies of the Cuban hierarchy, as first vice president of the Council of State, vice president of the Council of Ministers, and second secretary of the Cuban Communist Party. As the head of Cuba’s armed forces, he oversees both one of Cuba’s most respected and powerful institutions as well the leading economic powerbroker on the island. As such, Raúl Castro has institutional influence that is disproportional to any other government minister. The military is widely viewed to be the guarantor of any succession process in Cuba, and, as such, its leader will inevitably play a crucial role. Nevertheless, the differences between the Castro brothers have been well documented, with Raúl often suffering in the comparison. He is seen as lacking the charisma and vision of his older brother, instead playing the perennial role of second banana. Some former Cuban officials have cited strong disagreements between the Castro brothers driven by a big communication gap. Raúl is said to feel undervalued by Fidel, despite the fact that he has played a key role in organizing the structures of the Communist Party and has faced down many internal rivalries during his long career.9 One of Cuba’s Vice Presidents, José Ramón Fernández, describes him as follows: “He is a hard worker, very systematic and demanding with himself and others. … Maybe because of those qualities people who don’t know him think he’s unreachable, but that’s not so.”10 Fidel Castro’s own daughter, Alina Fernández, has written a scathing critique of her father that describes her uncle Raúl as one of the few genuinely nice people in the Castro family. 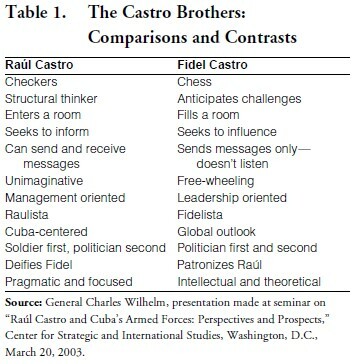 U.S. General Charles Wilhelm, who spent twenty hours with Fidel and ten hours with Raúl during three visits to Cuba, summarizes the differences between the two brothers using the following word association in Table 1. If Raúl Castro does indeed possess the loyalty of key military officers as well as a penchant for economic reform, then this may indeed prove sufficient to sustain a Raulista successor regime for some years. Any small economic opening would be a welcome development for much of the Cuban population if it represented a step towards alleviating the stark scarcity facing most of the island’s citizenry. Some analysts have posited that loyalty to Raúl is a necessary prerequisite for management of the state-owned enterprises controlled by Cuba’s armed forces.16 Indeed, with the apparent blessing of Cuba’s maximum leader, the familial and institutional advantages of being both a Castro brother and head of Cuba’s Armed Forces, and a lifetime of tutelage at the elbow of Cuba’s shrewdest politician, Raúl Castro is well-positioned to see off any rival for Cuba’s future leadership. But the question remains—do his ambitions include assuming the post of maximum leader of Cuba? Perhaps in the absence of his brother, Raúl Castro would be content to spend his final years as the “chairman emeritus” of his beloved armed forces, while leaving the politics, once again, to the Cuban politicians. While Fidel and Raúl Castro are the most visible members of the Cuban government to occupy top positions in the Council of State, Council of Ministers, and the Politburo, they are joined by five other men at the apex of Cuba’s power structure: Carlos Lage Dávila, Abelardo Colomé Ibarra, Marcos Portal León, Pedro Miret Prieto, and José Balaguer Cabrera. 17 Taken together, these individuals represent the second highest level ring of power in Cuba. Yet, with the exception of Carlos Lage, most are virtually unknown outside of the island except to a rarified group of Cuba watchers. They are the most reliable partners of the Castro brothers and the only members of the government seen as fit to serve in all of the country’s overlapping power centers. Any effort to contemplate a future succession process in Cuba must consider the personalities that make up this ruling group. Carlos Lage was appointed to the powerful post of secretary of Council of Ministers in 1990 and became a vice president of the Council of State in 1993. Only 53 years old, Lage is the youngest member of this group, but his resume consists of a succession of high ranking posts in some of the country’s most visible and influential organizations. He became the president of the Federation of University Students (FEU) in 1975 and was elected as a delegate to Cuba’s National Assembly the following year. Lage was named first secretary of the Union of Communist Youth (UJC) in 1982, at the age of 31, and he joined Fidel Castro’s special assistance and support team in 1986, the same year that he became a member of the Council of State. As with many younger members of the Cuban government, Castro is said to have a close “father-son” relationship with Lage.18 During Cuba’s Fourth Party Congress in 1992, Lage was reported to be the intended beneficiary of a plan for “controlled political opening” that was to transfer significant political power to the office of prime minister, a position for which he was the leading candidate.19 Although the plan was eventually nixed, Lage has subsequently served in what many perceive to be a prime ministerial role, with a more visible policy presence than any other member of the top cabinet, including Raúl Castro. Lage has long been considered one of the leading civilian figures in Cuba’s hierarchy, frequently visiting and negotiating cooperation agreements with other countries and playing a key role in formulating economic policy. He is perhaps the most visible member of what many analysts consider to be the “reform faction” within the Cuban government. However, in June 2004, Lage appeared to have his wings clipped by the military when responsibility for the tourist sector was officially moved under the Revolutionary Armed Forces, prompting speculation that his influence is on the wane.20 In a recent book, one former Mexican Ambassador to Cuba has written that Fidel Castro may have sown the seeds of this power struggle by increasingly favoring Lage when an internal government poll found most Cubans disapprove of the decision to turn power over to Raúl Castro.21 Nevertheless, Lage remains a visible presence within Cuba and has—correctly or not—given some sectors of Cuban society the impression that his penchant for economic reform is accompanied by a greater tolerance for political and civil liberties. A physician with no military experience who is several decades younger than most of his colleagues in Cuba’s inner circle, Carlos Lage remains one to watch. Another leading figure in Cuba, General Abelardo Colomé, comes from a professional military background that sharply differs from Lage’s. Colomé joined Castro’s rebel army in 1957 and became the chief of counterintelligence in 1970. He later led Cuba’s Armed Forces in Angola, served as Vice Minister of Defense in the mid-1970s, was elected to the National Assembly in 1976, and joined the Council of State in 1986. Colomé emerged as Minister of the Interior in 1989, following the drug trafficking scandal that resulted in the execution of General Arnaldo Ochoa. Today, as a vice president of the Council of State and the head of the powerful and feared Interior Ministry, Colomé is a major powerbroker within the Cuban government and second only to the Castro brothers in terms of the political influence he controls. Colomé was the first army general to be honored as a “Hero of the Republic of Cuba,” and he is the most likely successor as defense minister in the event that Raúl Castro is elevated to the top spot or is no longer able to serve in that capacity. As the Minister of Basic Industries since 1983, Marcos Portal León is another major figure in Castro’s inner circle with a profile more similar to Carlos Lage than to the older members of Cuba’s revolutionary vanguard. 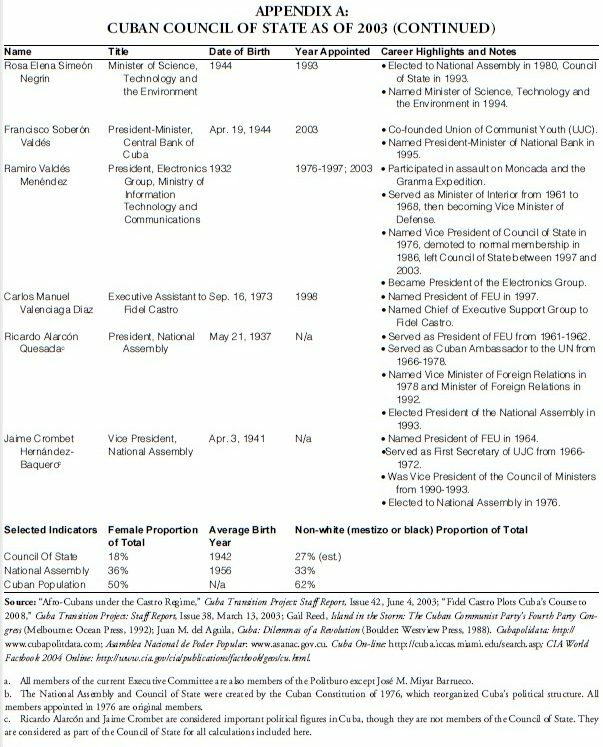 Born in 1945, Portal was trained as a chemical engineer and first rose to prominence as the secretary general of the University of Havana chapter of the Union of Communist Youth (UJC) in 1972. He later married a niece of Raúl Castro, and in the early 1980s, served on the personal logistics and support team of Fidel Castro until he assumed the leadership of the Ministry of Basic Industries. During the 1990s, Portal was among the few civilians to become involved with “Perfeccionamiento Empresarial,” the enterprise rectification process led by the Cuban military. In this capacity, Portal redesigned the Ministry of Basic Industries to incorporate greater market mechanisms, mixing greater autonomy with economic incentives based on performance. This experience helped him to emerge as a key player in the process of economic reform, and he has negotiated deals with major international companies including Sherritt, Petrobas, Repsol, and other foreign partners.22 He is widely considered to be one of Cuba’s most efficient and competent ministers. The final two members of Cuba’s top team are veterans of Castro’s rebel army in the 1950s, and they rank among the oldest members of the Council of State. Born in 1927, General Pedro Miret Prieto was an original participant in the 1953 assault on the Moncada Barracks and in the subsequent Granma expedition that launched the revolution in the island’s Sierra Maestra. Appointed to his first ministerial post as head of agriculture in 1959, he later became Minister of Mining in 1969. Another seasoned veteran, José Balaguer Cabrera, aged 72, served as the Chief of Ideology from 1985 until 2003, when he moved to the Ministry of Public Health to oversee an influx of investment in health services planned by Castro as part of the “Battle of Ideas” intended to shore up support for the Cuban Revolution among the island’s increasingly frustrated populace. Although they are ensconced at the apex of the Cuban government, the advanced age of both of these men means that neither is likely to be a contender for succession in Cuba. Indeed, faced with the eventual absence of Fidel Castro, it is unclear whether their elevated positions will give them significant influence in future decision-making processes. The five men who serve below the Castro brothers in the overlapping power centers of the Council of State, the Council of Ministers, and the Politburo reveal an interesting contrast between the dominant influences in the Cuban government. Lage and Portal are younger civilian technocrats, elevated to their current status by Fidel Castro, who have demonstrated leanings towards economic reform that reach back for two decades. Balaguer, Colomé, and Miret are veterans of the 1959 Cuban Revolution, and the latter two are generals in the Cuban armed forces. Taken as a whole, these groups are representative of the two major trends that are likely to shape a future Cuban government—the increased prominence of the military balanced against an openness to experiment with greater economic reform than has been possible under the rule of Fidel Castro. Despite their privileged position, however, this rarified subset is far from the only ones who will have a say in—and, in some cases, compete for—the top spot in an eventual Cuban succession. While the odds are undeniably tilted in Raúl Castro’s favor as the heir apparent for all of the top roles, the increasingly visible role of the Cuban military may elevate the need for a civilian prime minister, in effect revisiting the concept for a political opening first discussed by at the Fourth Party Congress in 1992. The next section discusses other figures of note that may rise to prominence or pull strings behind the scenes during a succession scenario. In addition to the Cuban policymakers who sit at the highest seat of authority in Cuba, there are a number of ministers and government figures that have distinguished themselves through their lengthy service and the ability to balance the need for economic reform against the political limitations imposed by Fidel Castro. However, many of these presumed reformers have suffered setbacks as of late. José Luis Rodríguez, the minister of the economy who backed many of the reforms implemented during the mid-1990s, has been removed from the Council of State and lost four of his six vice ministers in a mini-purge that occurred in 2003. Roberto Díaz Sotolongo, the justice thought to be open to reform, also lost his seat at the highest table in 2003. Meanwhile, the Cuban government has engaged in a series of elite personnel changes, appointing new heads for the department of ideology and the ministries of finance and transportation. Although it is difficult to predict how roles will develop in the post-Castro future, there are four people who merit additional attention, although for vastly different reasons. The first member of this group is Ricardo Alarcón Quesada, the president of Cuba’s National Assembly of People’s Power, the 609-member unicameral legislature that theoretically serves as the highest governing body of Cuba, but is more aptly described as the rubber-stamp parliament that ratifies decisions made by Castro and his ruling clique. The National Assembly meets once or twice a year in Havana’s Convention Palace, lacking even a permanent meeting spot for its deliberations. Serving as President of this body seems an unlikely role from which to achieve prominence, but Ricardo Alarcón has succeeded in positioning himself as one of the leading contenders for the top job in post-Castro Cuba. Born in 1937, Ricardo Alarcón served as the president of the Federation of University Students (FEU) in 1961-62, a post that has served as a stepping stone for many of the top members of Cuba’s hierarchy. Beginning in the mid-1960s, he embarked on a diplomatic career that spanned more than a quarter century. Alarcón served as Cuba’s ambassador to the United Nations from 1966 to 1978, and was subsequently appointed as vice minister of foreign relations, a post he held for 14 years. In 1992, he was briefly elevated to Minister of Foreign Relations, and in 1993 he was elected president of the National Assembly, a role he has now held for more than a decade. Alarcón is best known as the lead point man for U.S.-Cuban affairs, a role for which he is uniquely qualified by living for more than a decade in New York City in the 1960s and 1970s, an extremely rare experience for any member of Cuba’s ruling class. He has played a central role in several sensitive U.S.- Cuba negotiations, including the 1994 migration accords and the 1999-2000 custody battle over young Elián González, the Cuban boy who washed ashore in Florida and was informally adopted by Miami relatives before eventually being returned to his family in Cuba. Alarcón’s star rose dramatically during the González affair, and he was subsequently tasked with the thankless chore of trying to secure the return of five Cuban spies sentenced to long prison terms in the U.S., known in Cuba as the “Five Heroes of the Republic.” Despite an extensive publicity and media campaign in Cuba to rally support for this case, many Cubans are underwhelmed by the cause of five mustachioed, middle-aged men who were admittedly conducting espionage on Cuban-American groups in Miami. As a result, Alarcón’s star has dimmed somewhat in the eye of the Cuban public, both due to the dubiousness of this effort as well as the apparent fruitlessness of the task at hand. Nevertheless, as a trained diplomat at the head of what passes for Cuba’s legislature, Alarcón is equipped with shrewd political skills, deep knowledge of the United States, and a potential political power base that will make him a formidable contender for a prime ministerial position in post-Castro Cuba. Although a member of the politburo, he is also one of the few top leaders not deeply engaged in the economic management of the country, a fact that has left him with relatively little baggage during previous battles over economic reform, and makes him a less threatening presence for Cuba’s deeply entrenched economic interests. While this level of devotion has led some to dismiss Pérez Roque as merely Fidel’s lapdog, he is perhaps better described as the sentry who both supports Castro’s revolution and has become its most public defender in international circles. His over-the-top anti- U.S. rhetoric in international forums such as the United Nations has repeatedly provoked the ire of American officials. In the fall 2001, Pérez Roque lashed out at the U.S. invasion of Iraq. During another heated exchange at the U.N. in November 2003, the Cuban delegation had proposed a resolution urging Washington to end the trade and travel sanctions against the island, a non-binding measure that has passed with overwhelming support for the last twelve years. The U.S. representative replied that “Cuba’s best day is when the Cuban people have terminated Castro’s evil Communist dictatorial regime and said to him, ‘Hasta la vista, baby.’” In response, Pérez Roque departed from his prepared text to explicitly rebuke the U.S. assertion. “I am sorry to say that the representative of the United States will never in his entire lifetime have the slightest possibility of saying ‘Hasta la vista, baby,’ to the people of Cuba. It is the people of Cuba, with the support of the international community, who will say ‘Hasta la vista to the blockade.’” Pérez Roque also emerged as the public face of the regime following the mass arrests of dissidents in the spring of 2003, when he held an international press conference to promote the Cuban government view that the opposition figures were in cahoots with the U.S. Unlike Alarcón, Pérez Roque is an unlikely candidate for succession in Cuba in the short term. Yet he is one of the few members of his generation to hold a high level position in the Cuban government, and he has also shown the potential for outreach to some sectors in the Cuban-American community. Further, Pérez Roque is among an extremely limited group of high officials to show occasional bits of personal charisma in public view. Although his high profile public relations role in handling the recent dissident crackdown may make it difficult for him to remain politically viable if Cuba were to undergo a democratic transition, his brand of fiery youth politics will likely remain a quantity in demand by the less telegenic members of Cuba’s aging gerontocracy. If Cuba’s foreign minister represents Castro’s effort to impart his ideology to the next generation, then the re-emergence of the feared Ramiro Valdés reflects an increasing reliance on the traditional hardline. A veteran of the 1953 assault on the Moncada barracks, Valdés served as the Minister of the Interior from 1961 to 1968, during the years of greatest upheaval following the triumph of the Cuban Revolution. Valdés later served as vice president of the Council of State from 1976 until 1986, and remained as a member until 1997, when he was rotated off Cuba’s highest governing body. Yet in 2003, Valdés was once again elevated to a position in the Council of State, a move that may have presaged the crackdown on internal dissent and the increasing political rigidity that characterizes the Cuban government. As the president of Cuba’s Electronics Group, Valdés is among a number of high-ranking officials with substantial economic interests in the island’s state owned enterprises. Castro has turned to Ramiro Valdés during difficult times in the past, most notably in 1979, when he reprised his role as Minister of the Interior to help repress rising domestic opposition.24 Only slightly younger than Raúl Castro, Valdés has little hope in emerging in a top role during a successor government, but his perennial role as hatchet man may prove useful to a regime struggling to chart troubled waters during a period of likely domestic dissent. As the proverbial bad penny that keeps turning up, Valdés’ long experience with the repressive instruments of the state may allow him to retain influence in a post-Castro government. In authoritarian regimes long dominated by a single personality, kinship has often played a surprising role in shaping the leadership of the successor government. Although this is certainly the case with Raúl Castro, it is worth considering that power often passes to the sons of the chief leader once he passes from the stage. While this is certainly true in monarchical societies, it has also occurred in countries with a secular authoritarian tradition. In some instances, the sons have spent decades training at the sides of their fathers, such as the cases of Kim Jong-Il, the reclusive son of North Korea’s founding leader Kim Il-Sun, who has now ruled that country for more than a decade. In the authoritarian democracy of Azerbaijan, the death of founding president Heydar Aliev led to the ascension of his son Ilham Aliev, through an appointment process that was widely criticized. In other instances, the progeny gained power when barely out of childhood, as occurred with Jean-Claude “Baby Doc” Duvalier, who assumed the leadership of Haiti at the age of 19 following the passing of Francois “Papa Doc” Duvalier in 1972. He went on to rule the country for another 14 years. In yet other examples, the sons of ailing leaders have lived their lives outside the political system, only to be recruited back to take the helm at the moment of transition, as occurred with Bashar Assad, the London-based opthamologist who suddenly assumed the presidency of Syria in 2000 when his father, the late Hafez Assad, was on his deathbed. It is worth keeping these examples in mind when one turns to the case of Félix Fidel Castro Díaz Balart, the eldest son of Fidel Castro. Born in September 1949 and known by the nickname “Fidelito,” the younger Castro has long had a difficult relationship with his overbearing father, who soon separated from his mother. In the fall of 1956, the elder Castro left his son behind with friends in Mexico as he launched the Granma expedition that would ignite the rebellion in Cuba’s Sierra Maestra. This decision was one incident in a custody battle over Fidelito between Fidel Castro and his ex-wife, Mirta Díaz-Balart, that would extend over many years. At the time, he explained that “I do not make this decision through resentment of any kind, but only thinking of my son’s future. … And I leave my son also to Mexico, to grow and to be educated here in this free and hospitable land.”25 Castro later gave his 7-year old son a pistol as a farewell present. The two were reunited nearly three years later on the outskirts of Havana in January 1959, and Castro’s newfound authority allowed him to triumph in his efforts to keep Fidelito with him in Cuba, while his ex-wife moved to the U.S., and eventually, Spain. Today, Fidelito lives in Havana and is a consultant to the Ministry of Basic Industries. He is said to have an estranged relationship with his father and clearly has no role in any of the major power centers in Cuba. Yet, it is not inconceivable that he could play a role in a future succession scenario in Cuba. He is younger than many members of Cuba’s old guard, and he may be able to derive some legitimacy as the bearer of the Castro name. Further, he is not seen as playing a key role in the struggles between the economic reformers and the ideological hardline that is presumed to have influenced Cuba’s economic policymaking over the last decade, a fact that may elevate his chances as emerging as compromise candidate. Would Cuba really tolerate another Castro generation? It seems unlikely, yet historical experience indicates that when all else fails, blood ties sometimes emerge as a surprisingly powerful determinant of future leadership. The history of authoritarian politics is filled with examples of sons who could never measure up to their fathers in life, yet somehow are able to fill their shoes when the opportunity presents itself. Admittedly, it is a bit soon to predict what sort of succession or transition process might emerge in post-Castro Cuba. Some analysts argue that whatever process evolves will likely be based in the institutions and personalities that exist on the island today, while others believe that the Cuban system will undergo a rapid democratic evolution that will allow new and independent actors to fill important leadership positions. Nevertheless, it seems likely that the Revolutionary Armed Forces, the Politburo, the Council of State, the Council of Ministers, and even the National Assembly will retain significant influence in the island’s future politics. If succession occurs, then Cuba’s future leaders are likely to seek continued political stability, marginal improvement in economic performance, the containment of popular dissent, and an image of international legitimacy. While Raúl Castro and other members of the armed forces may be capable of achieving the first three parameters, they may well need a civilian face to prevent the government from being seen as an entirely military regime. In this sense, civilian leaders such as Carlos Lage, Ricardo Alarcón, Marcos Portal, and Felipe Pérez Roque are potential candidates for the prime ministerial role that was initially envisioned in the Fourth Party Congress of 1992. Even in the event that the regime quickly transitions towards a democratic government, many of these politicians may be able to reposition themselves as representatives of democratic socialism, much like what occurred in the formerly communist countries of Eastern Europe. One way or another, the influence of Fidel Castro’s communist regime will persist into the next era, irrespective of whether Cuba’s next leaders are elevated through succession or elections. 1. The author thanks Adam Minson of the Inter-American Dialogue and James Rich of Cornell University for their first-rate research assistance on this paper. The ideas expressed belong to the author alone and do not necessarily reflect the views of the Inter-American Dialogue or other affiliated parties. 2. Jaime Suchlicki, “Cuba After Castro,” The World and I, January 2004. 3. “Fidel Castro can live to 140, doctor says,” Associated Press, May 19, 2004. 4. Larry Luxner, “An Exclusive Cuba News interview with Ricardo Alarcón,” Cuba News, May 2004. 5. “Cuba’s Communist Party Expels Robaina,” Miami Herald on-line edition, August 1, 2002. 6. The information used to describe the functioning of Cuba’s political system—and the related membership in the country’s governmental structures—comes from a variety of sources. While there are several sources that list the memberships in key groups, and others that provide brief bios of key figures in the Cuban system, the available data often conflicts or does not take into account more recent changes. 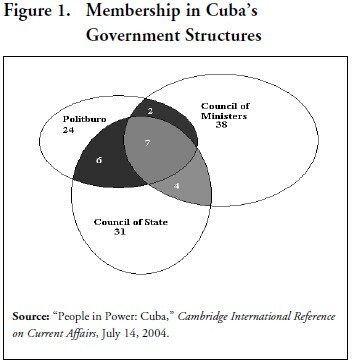 The information regarding the Council of State, Council of Ministers, and Politburo presented here uses the following core sources: “People in Power: Cuba,” which is released by the Cambridge International Reference on Current Affairs; as well as Asamblea Nacional del Poder Popular: VI Legislatura: Miembros del Consejo de Estado: http://www.asanac.gov.cu/espanol/legislatura6/ legislatura6.htm; Gobierno de la Republica de Cuba: Miembros del Gobierno: http://www.cubagob.cu/gobierno.htm; and Cuba On-line: http://cuba.sis.miami.edu/search.asp. 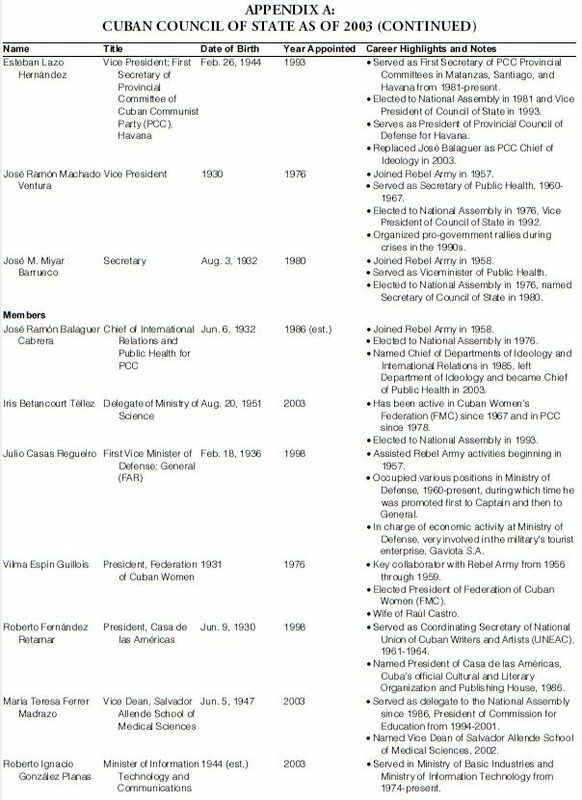 The first two web pages are Cuban government sources that list the members of the Council of State and Council of Ministers, including biographical information. These pages were updated in 2003 and 2004, respectively. The last source is the online database of the Cuba Transition Project at the University of Miami. It contains biographical information on most of the people considered here and is current to at least 2001. The sources do not always agree, but all information in this paper is supported by at least two of the sources, and reflects any credible news about changes in the Cuban government and Communist Party in the last several years. 7. Vanessa Bauzá, “Looking at Cuba’s Future: Who is Raúl Castro?,” Florida Sun-Sentinel, July 1, 2001. 8. Andrew Chang, “Post-Castro Cuba,” ABC News, August 13, 2001. 9. Alcibiades Hidalgo, presentation made at seminar on “Raúl Castro and Cuba’s Armed Forces: Perspectives and Prospects,” Center for Strategic and International Studies, Washington, D.C., March 20, 2003. 11. Brian Latell, “The Cuban Military and Transition Dynamics,” Institute for Cuban and Cuban-American Studies, 2003, p. 6. 12. Andres Oppenheimer, Castro’s Final Hour (New York: Simon & Schuster, 1992), p. 300. 17. The analysis of who composes the “inner circle” is principally taken from the July 14, 2004, briefing of the Cambridge International Reference on Current Affairs, with two exceptions. The first case is Felipe Pérez Roque, whom the CIRCA document lists as a member of the Politburo, a fact which conflicts with several other reputable sources that simply identify him as on the organizing committee of the Communist Party. Thus, I have excluded him from this group. 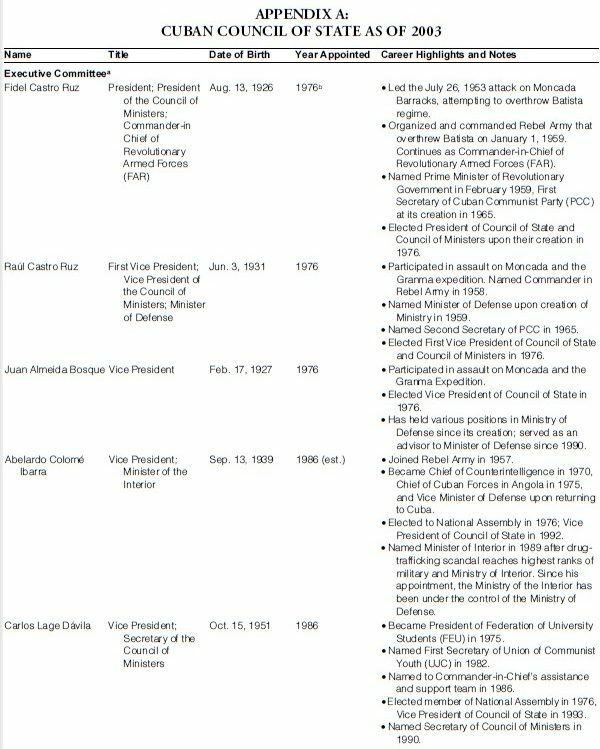 The second case is General Pedro Miret Prieto, whom the Cambridge document does not list as a member of the Politburo. However, both Cuba On-line and the Asamblea Nacional page include him as a member of that body since at least 1983, and I have included him in this group. Both of these cases are ambiguous in part because the Cuban government has not published a current list of Politburo members online. Whether members of that body in 2004 or not, both men continue to hold positions on the Council of Ministers and the Council of State—an influential subset in its own right. 18. Leycester Coltman, The Real Fidel Castro (New Haven: Yale University Press, 2003), p. 316. 21. Tracy Eaton, “Power Struggle Within Cuba?,” The Dallas Morning News, July 18, 2004. 22. Cuba Transition Project Database. 23. Ann Louise Bardach, Cuba Confidential (New York: Random House, 2002), p. 282. 24. Robert E. Quirk, Fidel Castro (New York: W.W. Norton & Company, 1993), pp. 794-5.